Well, you gotta give 'em points for a cute pun -- Embassy Suites on Waikiki's Beach Walk has come up with Embassy Sweets, signature desserts from two restaurants housed in the hotel. Ruth's Chris Steak House offers chef Leighton Miyakawa's Mud Pie, with three layers of Haagen Dazs chocolate, vanilla and coffee ice creams, chunks of Oreo cookie crumbs and an Oreo crust. At Roy's Waikiki, chef Jason peel offers a Coconut Trio, a portion of coconut crme brle, Chocolate Decadence and haupia -- with the bonus of a Bubbies coconut chocolate mochi ice cream. Although both restaurants have multiple locations nationwide, these desserts are on the menus only at their Embassy Suites sites. 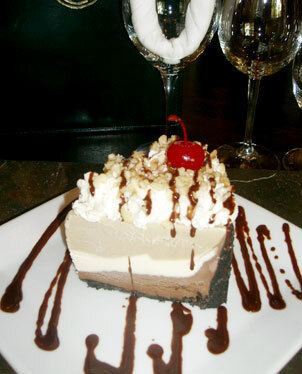 A Mud Pie made with an Oreo crust and three types of ice cream is the designated Embassy Sweet at Ruth's Chris Steak House at Waikiki Beach Walk. The Moana Surfrider is bringing afternoon tea back to the Veranda. Custom tropical tea blends by the Tea Chest are featured, along with a selection of finger sandwiches, scones and pastries. For example: the Moana Sunset tea with ohelo berry and mango or the Veranda Breeze, a blend of caramel and Hawaiian vanilla; with nibbling choices of focaccia with Westphalian ham, open-faced smoked salmon roll, scones with rich cream, to name a few. Tea is served from 1 to 4 p.m. daily. Cost is $32.50. Champagne and Afternoon Tea is $42.50. Call 921-4600. Hank's Haute Dogs: The Kakaako restaurant celebrates Fat Tuesday and Tuesdays beyond with Alligator Andouille, made with a New Orleans-style sausage, tomato-onion relish and horseradish cream. The spicy addition will be available on Tuesdays only. Call 532-4265. Tio's Garage & Taco Station: Weekend brunch has been added at the Tex-Mex restaurants, with such specials as Baja Fried Rice, Crispy Bacon Hashbrown Quesadillas and Huevos con Chorizo. Brunch begins at 11 a.m. Call 596-8359. Compadres: The Ward Centre restaurant offers a special menu for couples through the month. The four-course dinner centers on an entree choice of Pollo Cabo Wabo (chicken), Pescado (fish) or Steak and Camarones (prawns). Cost is $85 per couple. Call 591-8307.